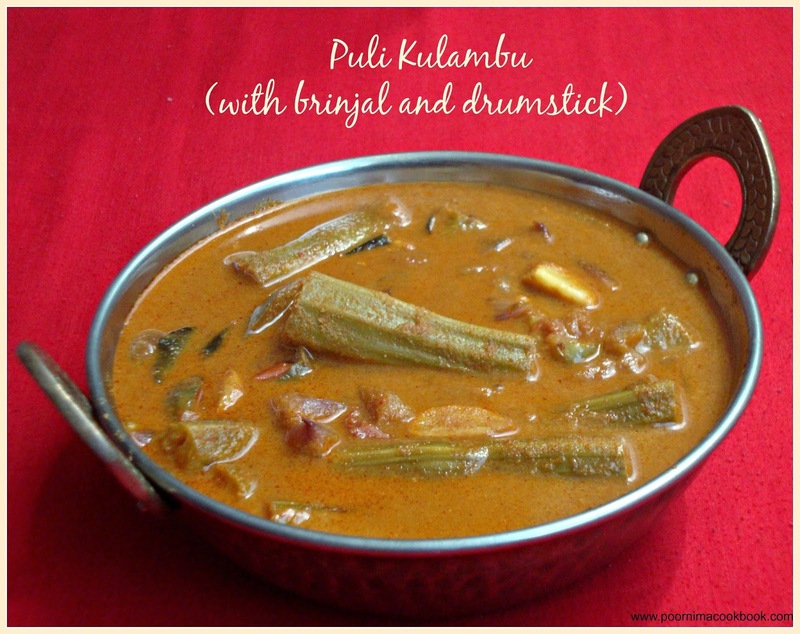 Puli kulambu is a tamarind based south Indian gravy goes well with steamed rice and any simple stir fry / poriyal or kootu! You can try this recipe using ladies finger or bitter gourd, but I love drumstick and brinjal combination and it taste delicious too. The recipe which i am sharing here is my mom's special which is one of my favourite. Do try and give your feedback! Grind coconut with little water to fine paste. Keep aside. Soak the tamarind in water. After sometime squeeze and extract the juice; keep it aside. Heat oil in a kadai and season with mustard seeds, urad dhal, fennel seeds, fenugreek seeds and curry leaves. Once it splutters, fry the garlic and onion. Saute till the colour changes; then add tomatoes and salt. And sauté till tomato becomes soft. Now add brinjal, drumstick and mix well. Saute for a minute. Then add tamarind extract, all spice powders and coconut paste along with ½ cup water (add water according to the desired consistency). Close the pan with a lid and cook in a low flame for 5 to 10 minutes, till the vegetables becomes soft and gravy thickens. Let it simmer for 10 minutes or till the oil comes out. Remove from fire and serve hot with steamed rice. This is also a best accompaniment for Idli and dosa. The colour of the kulambu depends upon the colour of the spice powders you are using. you can also add sambar powder instead of red chilli powder and coriander powder for this gravy.